The country is cracking down on MS-13 by cracking down on illegal immigration. The US Attorney General made this promise to an audience in Long Island after learning of 15 gang-related deaths since last year. The country is cracking down on MS-13 by cracking down on illegal immigration. The US Attorney General made this promise to an audience in Long Island after learning of 15 gang-related deaths since last year. But is that really the answer? WUSA9 dove into this underworld as the Northern Virginia Regional Gang Task Force tries to fight the MS-13. Strong borders may help, but that's not the only issue police are up against. It was around 9:30 p.m. on a warm, April night in Herndon, Va., when police rolled up to a dugout to check the area. A boy pops out of the dugout and starts running. Then a second. A third. Three young boys dashed across the field and towards a townhouse community. "Police! Stop!" yelled Sergeant Claudio Saa with the Herndon Police Department. He quickly got on the radio, "We got three juveniles running from us." Lt. Jonathan Weeks slammed on the breaks and jumped out of the driver seat. The foot chase was on. This was a night operation or 'ops' in Herndon. The Northern Virginia Regional Gang Task Force has put the pressure on the alarming gang presence in our area. We also went with them on a day operation in Manassas: The Iron Gate community. That's where we found the words S-U-R spray-painted on the side of a fence. Freshly painted in blue was a big 'X' right across the S-U-R. Then, just a little bit further around the fence's bend, we found MS-13 spray-painted in blue with no 'X' across it. "That's another gang that MS-13 crossed out. It's a sign of disrespect," said Lt. Weeks. Police searched all of Prince William County on this day. Lt. Weeks says this is where they once found Venus Lorena Iraheta, a teen in the high-profile missing person's case from Fairfax County last February. Iraheta had been reported missing more than once. She ended up being one of 10-people arrested in the MS-13 murder of a 15-year-old Maryland girl. That's when police started to sound the alarm of an MS-13 resurgence in our area. We were surprised to hear an ex-MS-13 gang member tell WUSA9, he's even afraid of the younger generation of MS-13. "I really started young, you know, with MS-13, but it was different back then. As soon as you don't get the green light to kill somebody, for example, you can't do it. These cats now, they don't think. The more vicious the crime is, the more they feel good about themselves. The more respect in their head that they get … even myself, I'm scared of them," said the man. "I walk away from it but if you ask MS-13, I'm not out. You never get out. The only way out is you get killed," said the man. He tells us now, "What they're doing is recruiting – recruiting the young, the new generation. That they're just...waiting for a chance to shine." Not only is recruitment up, but they're targeting kids as young as 5th grade, according to the Task Force Director, Jay Lanham. Their younger members are operating on social media more than ever before. They're getting harder to spot on the streets. This is what the Gang Task Force is up against as homicides increase. Lanham says there's been at least 14 gang-related murders in the capital region since January 2016; 8 in the North Virginia alone since last fall. Lanham says it's a violent gang that likes to use machetes in the murders. The ex-gang member tells us, "Now, these kids don't want to chop your head, they want to chop you in pieces." MS-13 is actually called La Mara Salvatrucha. It's a transnational Salvadorian gang that started in LA. They've been in the greater DC-area since the 90's according to gang experts. There's no one reason for the resurgence. However, the Gang Task Force is taking a hard look at the thousands of children coming across the U.S.-Mexican border. In 2014, about 4,500 of those kids were relocated to just Maryland and Virginia alone, according to the Federal Office of Refugee Resettlement. "Of course, they're not all gang members, but these unaccompanied minors are vulnerable, looking for families, looking to belong. Police say they're prime targets for gang recruitment …and yet in the same breath, they also say the MS-13 is not all an immigration issue anymore. "Now we're going through 2nd and 3rd generation. They're American-born MS-13 members," says Sgt. Saa. Our cameras were rolling as the Gang Task Force stopped a couple of teens and young men on a night operation. They wanted to arrest gang members, but they needed more information. That's because the gang members are trying to blend-in more. "They don't care about colors anymore 'cause they know that law enforcement looking into colors," said the ex-member. He also says Nike's are out. MS-13 gang members were always known for wearing Nike Cortez sneakers, but now most say that's out. The ex-MS-13 member says Adidas are in. The other tell is a Chicago Bulls hat (for now). They're not even required to mark themselves with MS-13 tattoos anymore, according to the ex-member who had gang tattoos up and down his arm. "I think the parents, what they need to do is see the way the kids start talking. That's when they know something is not right," said the ex-gang member. "What up maje," is one of the examples he gave. He says that's a way some of the younger members are greeting one another. The ex-member continues, "I mean if I could tell you what the gang would do, you just stab, shoot, kidnap, you know. One of the things that I hated the most was, I saw a few girls getting raped." He tells us he's haunted by the things he's done and the orders he's given others to do. His tattoos are his constant reminder. "I wanted to peel my damn skin off. That's --- I regret it," he said. The Northern Virginia Regional Gang Task Force says they no longer get federal funding. They have to pull resources from area departments, ICE and the FBI in order to keep the pressure on Virginia's gang presence. Montgomery County, Maryland has also become a problem area. 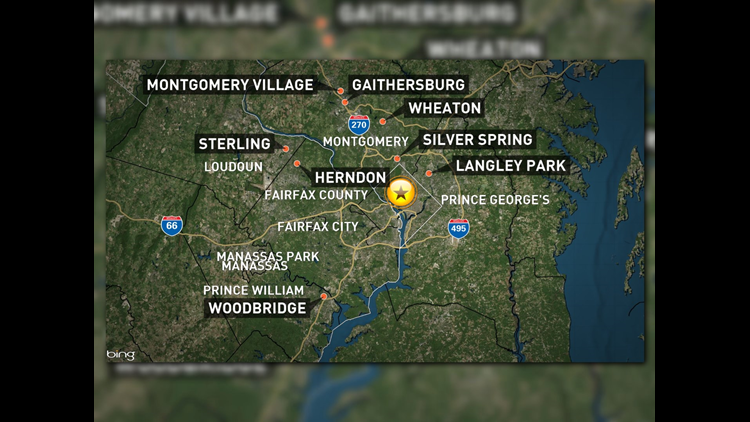 The county's State's Attorney, John McCarthy, tells WUSA9, they've seen around 16 gang-related homicides in two years. They're dealing with MS-13 and a rival gang called, 'Hit Squad.' However, after the high profile missing girls murder case, McCarthy says they decided to start a Gang Task Force Initiative. McCarthy believes more county programs are needed to support vulnerable kids in the area: give them an alternative to joining gangs, or the confidence to stand up and not join one.